Posted on Mon, Apr 9, 2012 : 2:56 p.m. The Washtenaw County Election Commission voted 2-1 on Monday to approve recall petition language submitted by a group trying to oust Michigan Gov. Rick Snyder. The commission's approval paves the way for a group called Michigan Rising to get started on a second attempt to recall Snyder following last year's failed signature drive. The hearing on the petition lasted about 20 minutes with an attorney representing Snyder arguing the petition language is unclear. Only one member of the commission, County Clerk Larry Kestenbaum, agreed with Snyder's attorney, while County Treasurer Catherine McClary and Washtenaw Circuit Court Judge Donald Shelton voted in favor of determining the language sufficiently clear. McClary said the petition language is "clearly inflammatory" and Snyder probably finds it "clearly offensive" but it has clarity nonetheless. "It's a clear allegation to me," Shelton said, reading the first few sentences of the petition language that elaborate on how Snyder has "abused the children of Michigan." There was some debate about that phrase and whether it was clear on a stand-alone basis. Shelton said it was clear based on the statements that followed it. Kestenbaum said he didn't think the language was clear enough but that it would take very little change to make it clear. Snyder opponents failed to collect the 800,000-plus signatures needed to put the question of recalling the governor on the ballot last year. Dearborn resident Marion Townsend, a representative of Michigan Rising and the filer of the petition language, believes there's more support for recalling Snyder now. "There has been a lot more that Gov. Snyder has done to basically alienate whole groups and communities of people since last year when we started our campaign," she said at Monday's hearing. "We've also got a year under our belt. We learned a lot over the past year about how this works, how to organize — we've got our grass roots going on." Townsend said the group has no funding at this point other than small donations people have sent. She said the typical donation has been about $18. "I think over the past year we have had maybe three $1,000 donations and the rest have all been $100 and below," she said. "Most of them are $3 to $25 and they're coming from people just like us — people who are watching these policies being enacted and are dissatisfied with the performance of Gov. Snyder." Monday's hearing, held in Washtenaw County because that is the governor's county of residence, was only to determine whether the recall language is clear. The commission makes no judgment about whether the reasons stated justify a recall. "Governor Snyder has abused the children of Michigan. He cut thousands of children off food aid. He robbed $400 million from the School Aid Fund, then slashed school payments. This forced children into crowded classes. Then he signed more laws that privatize services, attack teachers and blame unions. Snyder raised taxes on retirees and low and middle income working people, to make them pay $2 billion a year. At the same time, he gave an 86% tax cut, $1.7 billion, to large corporations. Snyder signed Public Act 4 of 2011, the Emergency Manager Law. Snyder used the law to take over cities and school districts. Snyder removed officials elected by the citizens. Snyder's agents broke contracts and sold off public property cheaply to corporations. "Richard Snyder has failed to pass a single law that helps Michigan citizens get jobs. He signed a law that cut state unemployment benefits from 26 to 20 weeks, and caused Michigan workers to lose 16 weeks of federal benefits." Andrea Hansen, an attorney for Snyder, said a decision hasn't been made yet whether the governor will appeal the commission's ruling. He has 10 days to appeal. Before leaving the hearing, Hansen expressed disappointment in the commission's approval of the petition language. "I don't think the decision was correct," she said. "These are experienced, knowledgeable people used to looking at recall petitions, and if they had this much trouble deciding whether or not they understood it — or whether it was sufficiently clear — that tells me it's not sufficiently clear to the person standing on the porch." Hansen acknowledged there are minimal standards for approval of recall petition language, but she said not even those were met. "There are multiple statements in this petition that would fail the clarity standard," she said, questioning the first sentence that Snyder has "abused the children of Michigan." Hansen said that statement is not only offensive and inflammatory, but it's also not understandable and could imply a lot of things. She also took issue with the statement that Snyder "robbed" schools of funding, which she said implies "some type of criminal conduct." She also questioned the statement that Snyder has raised taxes on retirees and low- and middle-income working people. There have been no tax increases during Snyder's administration, she argued, only modifications of exemptions and credits. Referencing the claim that Snyder is using the state's emergency manager law to take over cities and schools, Hansen noted the vast majority of emergency managers in place in Michigan were appointed under Gov. Jennifer Granholm. Townsend, who identified herself as "nothing but a mom," said she has a 9-year-old daughter who is in a school that is "being hurt very badly by the policies that are being enacted by Gov. Snyder." Townsend was joined by Jan BenDor, election specialist for Michigan Rising, and an attorney. They recorded Monday's hearing using a tripod-mounted video camera. Sun, Apr 15, 2012 : 5:35 p.m.
Why do we bother having elections if who we vote for and what we vote for get overturned? No wonder we can't get folks out to vote! Tue, Apr 10, 2012 : 10:20 p.m. In the 109 comments as of 5:18, back of the envelope counting of &quot;thumbs&quot; shows approximately 475 saying no to the recall petition or the recall in general. Support for the recall is a whopping 106 &quot;thumbs&quot; DOWN (as in no positive votes). Not including the approximately 30 on the grocery price stickers diversion and the even more entertaining intercine warfare on how many signed the recall last time. All very unscientific, but what do you expect on A2.com? Note to recall supporters: if you can't get close to positive on Ann Arbor's medium - you have an issue. But keep up the intercine warfare, it's a hoot. Tue, Apr 10, 2012 : 9:18 p.m.
Jobs come from business, not government. Government is not a self--sustaining entity, a fact Democrats never seem to be able to grasp. Government functions only because it has been granted the right to tax the proceeds of business and individuals to pay for social programs, construction of infrastructure, defense, law enforcement, medicaid/medicare, and education. Without business there is no government. I have no idea if Rick Snyder's plans are going to work. But after 8 years of Democratic ineptitude I am more than willing to give Snyder four years to try to create some positive momentum in our state.If he fails then we elect someone else. Mrs. Townsend cares for no one but her ideology. She and the supporters of Michigan Rising are no different than the Republicans at the national level who are harassing Obama or the Republicans who in the early 00's attempted to recall Granholm. Politics is a game. It is contested by two groups lusting for power and money. For government is the most corrupt entity on the face of the planet. Al that money and power just sitting there to be consumed and abused. Republican and Democrats are no different. They are two peas of the same pod. I love this country, but oh how I Democrats and Republicans. They are the scourge of this land. Tue, Apr 10, 2012 : 8:08 p.m.
Politico and other national media are reporting the same number of prior signatures being collected now as well, in addition to MSNBC, CNN, Fox News (yes, even Fox News), so I guess the news of the recall attempt of the NERD is getting some play. Thu, Apr 12, 2012 : 6:04 p.m. Wed, Apr 11, 2012 : 1:58 a.m.
Monica, I appreciate your passion, but that Website you pointed to begins with the bumper-sticker platitude, &quot;Help us put an end to CORPORATE AND POLITICAL GREED BEING PAID FOR BY YOU THE U.S. TAXPAYER!&quot; so nobody is read any further. Tue, Apr 10, 2012 : 10:12 p.m.
And ALL of those media resources have been contacted with the disputing information on DISPUTETHIS.ORG (in the last couple of days) that 500K signatures never existed, confirmed by none other than the (former) Treasurer's report on that site, from CRRS. Whom should we believe? The (former) Treasurer who had legal responsibility of the PAC's actions to the Secretary of State OR parties that say that 500K signatures exist, somewhere, anywhere....but this has never, ever been verified, up to today's date? (Insert-The various claims about CRRS on disputethis.org were discussed on a Blog Talk Radio show in detail, I'll leave nameless at this time). I'll say, believe the former Treasurer until the existence of these 500K signatures are provided as proof to the public-at-large, who've desired to see their presence over the past seven months. &quot;Since we did not make the August 5th deadline, it was decided to extend the campaign to September 20th and to pull all signatures that were gathered between May 21 and June 19, 2011. It should be explained here that signatures are only valid for a 90-day window period and the petition language approved by the State was only good for 180 days, thus we could choose our own window within the 180-day time frame. My volunteers completed the task of pulling all invalid signatures in mid-August which brought us down to 92,000+ valid signatures.&quot; Clue-3 More information is available on DISPUTETHIS.ORG. Learn the truth people, without the spin! Although I have not seen the news as you have reported Sparty, but I wonder if all these news outlets are reporting the actual recall efffort or if they are reporting on the ridiculous language that is on the petition? Tue, Apr 10, 2012 : 5:10 p.m. Since the first one did so well you might as well try again. I thought it was hilarious that they tried to raise a million dollars an only received 8 thousand. Tue, Apr 10, 2012 : 6:45 p.m.
Tue, Apr 10, 2012 : 6:12 p.m.
And obtained 500,000 signatures nonetheless. Hilarious, huh? Tue, Apr 10, 2012 : 2:35 p.m.
like him or not it ain't happen, these efforts to recall are useless. Tue, Apr 10, 2012 : 1:38 p.m.
OK, I'm writing this as a lifelong democrat, who did not vote for Snyder. Also, I'm writing it in the format that the &quot;authors&quot; should have used. This effort is pretty much pointless, because: * the opening sentence will be cherry-picked to make the authors seem like a bunch of loonies; *the statement appears to have been written by a middle-schooler (with apologies to middle schoolers); * Snyder won in a landslide, and; * we already have a recall mechanism. It's called the next election. Highly likely I'll vote (close to) straight Democratic ticket (to include for prez, as I think the current one is doing an excellent job) in November, but I can't get on board with this. I knew several moderates and liberals who bought into Snyder because of his tech background. Well, you made your bed, now sleep in it. Tue, Apr 10, 2012 : 1:16 p.m. I believe that installing Financial Emergency Managers was necessary - so much for the good that Governor Snyder has done. I also believe that the Governor's tax and other financial policies are destructively wrong. They are diametrically opposite to those policies which will bring new businesses and increased employment to Michigan. However, the Governor's new financial laws have only been in effect for a few months, and they have not had time to succeed or to fail to achieve his vaunted goal. If, at this time next year, the Governor's policies have been successful, he will deserve our thanks. If not, that will be the time to start a second recall campaign. Tue, Apr 10, 2012 : 12:58 p.m.
Let me understand this. Business gets to keep more of its own money and democrats are unhappy it is not going to the unions who in turn give it to democratic politicians in the form of campaign contributions? That is a good thing, not a bad thing. When public dollars are used to pay the salaries of union presidents, as is done in Ann Arbor, it is a betrayal of the public trust. The fact that the very democratic politicians receiving union contributions are also deciding on contract terms with the unions is a conflict us interest that ought to be criminal. Snyder has done the best job of governing the state since Bill Milliken. Far better than his helpless and hopeless predecessor. Tue, Apr 10, 2012 : 11:20 a.m. I hope the appeal is successful. Recall petitions are a form of legal document, in my mind, and should have responsible language on them. I'm not for the recall effort, but I respect the recall process and recognize the citizen's right to do it. However, I agree with other posters that the language looks like it was written by angry, whiny children and they should be required to rewrite it using adult language. Tue, Apr 10, 2012 : 11:10 a.m.
Tue, Apr 10, 2012 : 10:13 p.m.
Hesh, there are more than 70K jobs listed here: http://www.hiremi.org/jobs/job-postings and a very small percentage of them are automotive related. Most, if not all of them, were posted in the last year. Obama saving the auto industry has something to do with the economic recovery being experienced on a macro level, but the Big Three have not created 70K-plus jobs in Michigan in the past year. Yeah, let's go back to the wonderful and prosperous Granholm years. Tue, Apr 10, 2012 : 7:07 a.m.
Also, thank you reporter Ryan Stanton for not regurgitating the 500K signature fallacy claim in the previous article on this subject and instead focusing on realities of this story. Clue-1-Find Disputethis.org to read what went wrong with the last recall attempt, unfiltered. Tue, Apr 10, 2012 : 6:04 a.m. I wouldn't say over 500,000 signatures in the first Snyder recall attempt is a complete failure. How can anyone say that a half million citizens voting with their signature to get you out of office is a positive? It's just short of the required number of signatures to get on the state ballot. This time with the Detroit fiasco, I'm thinking that 800,000 signatures should easily be attained and that we'll also see a swing of the House from right-wing republican control to Democratic majority in November. Onwards! Tue, Apr 10, 2012 : 10:44 p.m. Instead of copy/pasting my last post....please see the information below under 'Sparty's' post at 4:08 PM 4/10/2012 near the bottom of this page. Thinking out loud 'Sparty'...that name kinda can rhyme with...(okay I'll leave that alone, for now). Tue, Apr 10, 2012 : 9:53 p.m.
Tue, Apr 10, 2012 : 8:06 p.m.
Tue, Apr 10, 2012 : 6:39 a.m.
Tue, Apr 10, 2012 : 5:19 a.m.
Tue, Apr 10, 2012 : 7:24 a.m. Contrary to how I'm sure many people perceive me (based on the reaction I got up above), I've got to say I agree with this post from top to bottom. Well said. Tue, Apr 10, 2012 : 4:30 a.m. So everyone knows that the governor elect would be Brian Calley, right? You think Rick is bad, you just wait until you see what you get under Calley. He's a conservative republican that will make Rick look like a Dem. I'm standing by their economic policy's that have put this state back on track of success. If it ruffles the feathers of teachers, that now have to justify tenor, or the unions that have to work harder, then so be it. This recall effort will be one huge waste of time. Tue, Apr 10, 2012 : 6:20 a.m.
Michael, Add to Lt. Gov. Calley holding the Governor's office if this 'recall' attempt is successful, the fact that Michigan's Recall Statue is debatable on when and if a special election would take place to either remove Gov. Calley, or elect a new Governor. Sadly changing the recall language this year is to the very party who hold a state legislative majority benefit ....i.e. Michigan's GOP. So, if (and as much as I would like to see Rick Snyder out of our state's Executive Branch) this 'effort' is successful (which I doubt) watch for the party who fail to understand what Immediate Effect means, to swiftly amend Michigan Recall Laws keeping Calley in office until the end of Snyder's term. So, what would be gained....nothing. Better focus for these folks would be on working to overturn Michigan's Republican controlled House of Representatives, by voting for State House Democratic candidates, November 6, 2012. Tue, Apr 10, 2012 : 5:44 a.m.
You are right, unfortunately. Going from Snyder to Calley would be like going from the proverbial frying pan into the fire. Tue, Apr 10, 2012 : 2:22 a.m. In a nutshell, the story is that the Michigan Constitution requires that bills wait until the end of the session -- essentially, the end of the calendar year -- plus 90 days before becoming law. You can, however, put a bill into effect immediately, provided you have a two-thirds majority in both chambers. Republicans have that super-majority in the Senate, but not in the House. Yet they appear to have given nearly every bill since they took over in January 2010 immediate effect Since January 2011, 566 bills have been passed by the House. Of those, 546 of them, 96.5% were passed under &quot;immediate effect&quot;. It is one thing to hold a majority and totally another to act illegally based on the super majority in both houses you might like to have but don't. You are not alone, the Rachel Maddow show brought his all to life. The Republicans have been breaking the law for the past 14 -15 months, passing immediate bills into law which the state constitution doesn't allow. They are claiming 2/3 vote, but don't even count the votes as needed. The Democrats have finally filed suit against the republicans, anxious to see how it plays out. According to the law, Benton harbor would have just been taken over by EFM last month, not days after the state mandated it over a year ago. Tue, Apr 10, 2012 : 7:20 a.m. Thank you. I thought I was alone on this side of the argument. Not sure if I just had bad timing or what, but you seem to be voted more favorably than my earlier posts. Tue, Apr 10, 2012 : 2:02 a.m.
Recall Snyder, and do what? Replace him with Benero or another ineffective, weak politician like Granholm? He's done what a governor in a declining state is supposed to do: make incredibly difficult decisions that benefit the majority of the people. He has financially stabilized this state. This is just liberal sour grapes, plain and simple. You live in a state on hard times. We don't have any room here for freeloaders and corruption. Deal with it. Or leave. Tue, Apr 10, 2012 : 2:31 a.m.
Leave out the &quot;liberal&quot; and you have a good point. Plenty of Democrats and Independents voted him into office and continue to believe he is trying to do the right thing. Those labels just detract from the facts, which are that people whose hands, arms and shoulders have been in the cookie jar for a long time are scared to death and will fight tooth and nail to maintain the status quo. Not all &quot;liberals&quot; are against him, and not all &quot;conservatives&quot; support him. It's also good to remember that the legislature has as much, or more, to do with what's going on in Lansing as does the Governor. There are some bills he's refused to sign, or made it known he would refuse to sign if they were advanced, overtly anti-union bills included. Tue, Apr 10, 2012 : 1:51 a.m.
Tue, Apr 10, 2012 : 12:24 a.m. The language in this petition pretty much guarantees that it will go absolutely nowhere. Guess Michigan Rising must have skipped the public relations classes in school. Tue, Apr 10, 2012 : 12:14 a.m.
Tue, Apr 10, 2012 : 5:40 a.m.
Tue, Apr 10, 2012 : 12:08 a.m.
Tue, Apr 10, 2012 : 3:30 p.m.
Sparty, Does the TRUTH hurts?. As for 'ruff feathers', lucky for moi I never collected a signature in the last recall that was in the end, placed inside a database. Yes Sparty, I'm sure you might have a little knowledge of that. Volunteers in Lansing nearly arrested last summer when they refused to hand over signatures to the 'core group' after learning the signatures would be placed in a database. (RE) (MT) Now, mind you those volunteers feathers were indeed a bit ruffled since they informed the public their signatures would never be used in this aspect. I wonder what those signers (and new potential ones) would think if the media would take a minute and investigate what happened in Lansing that night Sparty. But your concerned about a so-called bitterness.... No, the concern is for Michiganders who would donate a minute of time and a dollar of their money a organization who might have proven in Recall Rick 1.0 their ability to handle the task is questionable, at best. Tue, Apr 10, 2012 : 1:54 p.m.
Oh Monica give the bitterness a rest. 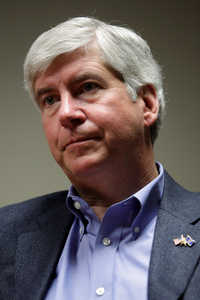 The goal is to recall Snyder not to soothe your ruffled feathers. Tue, Apr 10, 2012 : 6:06 a.m.
Tue, Apr 10, 2012 : 5:55 a.m.
Only if they want to end up in jail for decades - fake recall petitions or destroying recall documents is a felony, so election or recall fraud is serious business. Mon, Apr 9, 2012 : 11:49 p.m.
Mon, Apr 9, 2012 : 11:40 p.m.
Has anyone started a petition banning Marion Townsend from front porches and schools? Many Michiganders are allergic to poor grammar. Mon, Apr 9, 2012 : 11:30 p.m.
rick is the master of the land. Mon, Apr 9, 2012 : 11:28 p.m. Guess the democrats are just plain jealous that Rick has accomplished in little more than a year what they could not in 8 years at the helm of Michigan. What a bunch of cry babies. Tue, Apr 10, 2012 : 6:08 p.m.
Well, when you constantly mention the prior 8 years of Government, you're bound to get a reply ... or should we just accept the comments as facts from on high when it's not quite apples to apples comparisons we are looking at ? Who is assigning fault by the way? Are you feeling guilty? Tue, Apr 10, 2012 : 2:13 p.m.
&quot;Gov. Granholm had 8 years of a split government to negotiate with&quot; It's always somebody else's fault, isn't it? Tue, Apr 10, 2012 : 5:50 a.m.
Well a full partisan majority in both Houses of Congress does horrors, doesnt it! Gov. Granholm had 8 years of a split government to negotiate with, so it was a much more balanced, though slow process. Mon, Apr 9, 2012 : 11:25 p.m.
Recall him because he's done a better job in a year than Granholm did in 8. What a waste of time. Tue, Apr 10, 2012 : 12:10 a.m.
Michigan Man, I lived in Illinois for 20 years. Louisiana corruption has nothing on Illinois. When is the last time as state had it's last 2 governors, both doing Fed time? Mon, Apr 9, 2012 : 11:59 p.m.
Steve - I am on your team! Would be best if the recall crowd left Michigan. Let them waste their time and money in a different state. Let send them all to Illinois where democratic corruption really needs some time, attention and powerful community organizers with money to change that system of total waste. Mon, Apr 9, 2012 : 10:58 p.m.
A lot of people are abusing the system &amp; WE are paying for it. Mon, Apr 9, 2012 : 10:24 p.m.
Mon, Apr 9, 2012 : 9:07 p.m. The language of the petition reminds me of what we tell our children not to do or say on the play ground. Michigan Rising sounds like a group that wants the state to do better, but the words they used are more like those of a play ground bully or a stereotypical &quot;mean girl&quot;. Mon, Apr 9, 2012 : 8:50 p.m. I cannot believe the &quot;Hate&quot; that comes from those people! What happen to Peace, Love and Understanding? &quot;abused the children&quot; &quot;robbed &quot; &quot;Slashed&quot; &quot;attack teachers and blame unions&quot; All of this about a NERD? Mon, Apr 9, 2012 : 8:45 p.m. If the proposed reasons for recall had to be true, then any targeted official could litigate any recall and delay it until it was irrelevant. That's why sufficiency of reasons for a recall is a &quot;political question.&quot; In other words, it's up to the voters to decide what is sufficient reason. It is very difficult to recall a statewide official in Michigan. It requires gathering a million signatures in a mere 90 days. Tue, Apr 10, 2012 : 11:26 a.m. I agree, Larry, about the truth point, but I think what a lot of people are in disagreement with is the inflammatory language. There are responsible, adult ways of putting forth their disagreements and claims, and this should be required. I would think we'd be able to find the middle ground between matters of opinion and reckless disregard for accuracy and false accusations. Would it really infringe upon anyone's &quot;rights&quot; to expect &quot;The policies of Governor Snyder have jeopardized the educations of Michigan children,&quot; instead of &quot;Governor Snyder has abused the children of Michigan&quot;? Is that too much to ask in an allegedly civilized, reasonably educated society? Tue, Apr 10, 2012 : 12:26 a.m.
Monica Larry Kestenbaum is the County Clerk, not a Commissioner. Mon, Apr 9, 2012 : 10:20 p.m. Thank you for this information Commissioner Kestenbaum. It will be a interesting 90 days (or 180 like the last time) indeed. Mon, Apr 9, 2012 : 8:34 p.m.
Who wrote this thing? I hope that the language used was because they wanted people who had not finished grade school to understand it. It is very poorly written and shows that some folks just don't want to face reality still. The way it's written is a direct reflection of how much contempt these organizers have for their target audience. I completely agree with Basic Bob. False accusations and gratuitously, recklessly inflammatory language have no place on official documents and should be outlawed. If they can't state their case in a reasoned and factual manner, they should all be told to sit down and be quiet. Tue, Apr 10, 2012 : 1:48 a.m.
&quot;Who wrote this thing?&quot; . .the ignoratti, why? Mon, Apr 9, 2012 : 8:26 p.m.
wow, -30. Clearly your neighbors think your post is a little extreme. Tue, Apr 10, 2012 : 1:36 p.m.
&quot;** Keep in mind that this is a NEW petition drive, so even if you signed the first recall petition you'll have to sign again. **&quot; The fact you have to tell your audience this tells me you are aware your effort depends on an appeal to people with very little knowledge of anything. Good luck with that! Tue, Apr 10, 2012 : 12:15 p.m.
No way Cinco DE Mayo! Tue, Apr 10, 2012 : 2:04 a.m.
Good luck with that. Seems that most people are not on board, no surprise there. I don't agree with the way that this state handles recalls because it allows petitions like this to be filed. Opinions should be allowed, but false claims of criminal acts like &quot;Snyder abused children&quot; should not be allowed. Some people might believe that this is a verifiable claim simply because it appears in the ballot language. I will not support this recall petition or any other which makes false claims against an elected official. It may be constitutional, but it is not democratic. Tue, Apr 10, 2012 : 5:32 a.m. So you do not recognize the disenfranchisement of municipal voters as being unconstitutional? How about forbidding municipal officials who are removed from office by an emergency manager from holding office for five years after the emergency manager leaves? How about the emergency manager selling off city assets often at prices set by the emergency manager without competitive bidding? How about the emergency manager setting his own salary which is paid out of local funds and also hiring his friends to assist in dismembering the community? How about the emergency manager dissolving any contracts and replacing them without the community having a recourse? You do not recognize the opportunity for mischief from all this power? Nothing in the language about Governor Snyder torturing small animals or ringing doorbells in the middle of the night ? Tue, Apr 10, 2012 : 5:05 a.m. I doubt that he would do that or do you know something that I don't? Each of you who revere Snyder must be asked: Which of Snyder's policies do you like the most: his $1.8 billion tax break for businesses paid for by new taxes on retirees, or his disenfranchisement of city voters, or the reduction of unemployment insurance which increases the homeless and reduces the state's GDP, or the reduction in state funding of schools and cities, contributing to their financial difficulties? Mon, Apr 9, 2012 : 7:40 p.m.
Tue, Apr 10, 2012 : 1:31 p.m.
garrison, I'm going to go out on a limb her and say that perhaps the negative votes are because people simply don't agree with you. Tue, Apr 10, 2012 : 1:10 p.m. If your main issue is the 2/3rds early enactment of laws, then take issue with the legislature and have them legally delayed. Snyder has made a grand effort to balance the budget and put forth solid fiscal responsibility. We haven't had a governor this fiscally competent in a while. We should all be happy with this progress. Tue, Apr 10, 2012 : 5 a.m.
garrisondyer: The Republicans lined up for this one since they had thirty positive votes for the first supportive comment that was posted at 3:21 pm. Then they have hung around to attack any comments demeaning Snyder, whether appropriate or not. They are worried because most of the voters are likely to successfully recall Snyder and they believe that belligerence and numbers might change the outcome. It won't. Mon, Apr 9, 2012 : 11:02 p.m.
go tell Granholm your problems. @A20, I don't really feel like your post warrants a reply, since it really doesn't open anything up for discussion. @gyre, My main gripe here isn't with the emergency manager stuff. Frankly, that's a more complicated issue on which I don't land firmly for or against it. I can see reasons to support it (it's admirable) and reasons to grumble about it (can lead to abuse of power...). My main gripe here is with the way in which our legislature and governor are abusing their positions with the 2/3 &quot;immediate effect&quot; law. I'm sorry, but you can't simply circumvent the constitution and expect people to just accept it. Mon, Apr 9, 2012 : 8:54 p.m. Instead of letting cities on the verge of bankruptcy completely fail, the Governor makes an attempt to salvage fiscal issues through an existing law. It appears that you think the city will somehow pull itsself out of the gutter and have nothing but properity. Unless you have a better solution to resolving difficult issues, it is best to let the Governor make an attempt. If you do have a better solution, let's hear it. @james, Come on, you're making way too many unsubstantiated claims here. I think we could all agree that being responsible and accountable are things that our elected officials just need to do, or be booted out, right? How can you defend a bunch of elected officials that are trampling on the state Constitution in the name of saving a bunch of smaller entities within the state? That's not being responsible, nor is it accountable. I have no problem with elected officials doing their jobs, but if they're just going to do whatever they want at the expense of constitutional fidelity, they can get the ^*&amp; out. Mon, Apr 9, 2012 : 8:20 p.m. Right. We should continue to let a city like Detroit mis-manage money and continue to fall further and further into debt. Cities like this need someone to come in and take it over. The current administration obviously isn't doing their job. I watched the city council members act like a bunch of children when they were held accountable for their actions. This is why nobody wants Snyder: government officials will finally be held responsible for their actions and our tax money won't be pissed away. Granholm ruined Michigan. She passed a law that forced business owners to pay taxes on Gross receipts rather than net income. The result? Many businesses went under or left the state. I know at least 5 business owners that were forced to leave because of this. We need someone that understands business and is making changes to bring more companies to Michigan. A Democrat just won't do this. Are the people here who are voting down this post just against the Constitution, or what? Are they just voting me down because they like Snyder? Or because they just like all Republicans by default? Or because they think I'm some sort of wacko lefty (because really, I'm not!) I just think it's offensive how much our state government is disregarding and disrespecting the people of Michigan. What's not to like about sticking to the Constitution? Mon, Apr 9, 2012 : 7:39 p.m. I find it highly curious that these people are so blinded by the incompetence and mismanagement of certain local units of government, for example, their local school boards, that they think accusing the governor of &quot;robbing&quot; school districts is answer to all their problems. It's not the fault of people who have failed to secure education and/or work for more than four years that some kids lost access to certain welfare payments; it's the governor's fault. It's not the fault of school district administrators for misspending the money they get; it's the governor's fault. Is there any set of circumstances in which individuals bear responsibility for their choices/behavior/voting records? This state has been on a steady financial decline for years, yet a governor who's been in office a year is the root of all evil. Veracity, do you think if you keep repeating those unsubstantiated claims over and over they will somehow become true? Parroting anything tends to make people tune out. If you take a minute to think about your claims, you might see that shortening unemployment benefits does not &quot;increase homelessness,&quot; and I'd be interested to see some evidence to back up your claim. What it does is make people who were inclined to find work either do so or move to where they can. That is not a bad thing. Since homelessness skyrocketed in the 5 years before Mr. Snyder took office, I think you should point your finger elsewhere. As far as disenfranchising voters, please don't make me laugh. Voters in this state have been disenfranchised for YEARS by corruption, misfeasance, malfeasance, incompetence, etc. The governor's moves to put an end to outright theft of public money are welcomed by the majority of voters in the state. The only people upset are those whose gravy trains are drying up. Tue, Apr 10, 2012 : 4:52 a.m. I do not doubt that mismanagement happens at all levels of public administration though assuming that all schools and local governments suffer from incompetency and fraud is not justified. As far as the recall goes, you can pick your favorite issue from the following list: Snyder's $1.8 billion tax break for businesses paid for by new taxes on retirees, or his disenfranchisement of city voters, or the reduction of unemployment insurance which increases the homeless and reduces the state's GDP, or the reduction in state funding of schools and cities? Mon, Apr 9, 2012 : 11:08 p.m. Speaking of schools, we have a teacher friend that said if you don't use the money the state gives you whether you need the supplies or not the state takes them away. Why not pass it on to another school that needs it instead of punishing the school it was offered to for not using it? Mon, Apr 9, 2012 : 8 p.m.
&quot;This state has been on a steady financial decline for years, yet a governor who's been in office a year is the root of all evil.&quot; This only works for governor's. The reverse goes into effect with higher offices of government, lol. Mon, Apr 9, 2012 : 7:37 p.m.
Good news! The petition language was approved, good luck to the recall effort. The sooner we get Tricky Ricky out of office, the better. Bad news: Anti-consumer legislation he signed into law repeals the requirement that retailers put price tags on individual items in stores. All they have to do now is put the price on the shelf. Guess what happens at checkout when the price scans higher than the actual price, the consumer has no recourse to tell the clerk that the item has scanned too high (since there is no price tag on the individual item), and ends up paying a higher price. This change benefits big business at the expense of the consumer. Did we expect anything else from Tricky Slick Rick? Why was there no publicity about this anti-consumer legislation? One more example of why he needs to be recalled. -24? Seems you are in the extreme minority. Tue, Apr 10, 2012 : 3:38 p.m.
@tru2blu76, Excellent post. And if I am not mistaken, the person will be remunerative at 6 or 10 times the price differenct between the correct price and the wrong price. Not that I'm a fan of $nyder but those saying that &quot;recourse&quot; is still available under the law and WILL be remunerative at x times the retail price difference are correct. The average chain grocery has 10s of thousand of individual products and those are stocked by the case: meaning literally 100s of thousands of individual hand-applied price labels in total. You do realize: you pay for LABOR when you buy anything, don't you? Key concept: shelf labels have always been determinate and errors, while statistically uncommon, do happen. Typically: sale prices on self label are dated - and the out of date labels are sometimes missed (because it's another human-based task and there are MANY shelf labels needing constant updating). So it's just a matter of shifting your attention to shelf labels AND the specific info on them. BTW: cashiers at major chains are generally attentive to customer requests for price check - before the transaction is complete. Once you've paid, then it's off to the customer service counter to get the error corrected and your money refunded. Tue, Apr 10, 2012 : 1:33 a.m.
uhhhhhhhh - &quot;consumer has no recourse to tell the clerk that the item has scanned too high.&quot; that would be an ignorant action because if ya wait till after the cahsier then go to customer counter and make the observatoin, ya get a lot moer $$$ back. been there; doen dat. if ya tell the cahsier, you miss teh 'penalty' rewatrd. Mon, Apr 9, 2012 : 9:32 p.m.
JRW he did that cause he's racist, and hates women and children. Mon, Apr 9, 2012 : 8:19 p.m.
How do you expect to be taken seriously when you resort to childish name calling? Mon, Apr 9, 2012 : 7:34 p.m. Hasn't politics gotten great in our state/country? People care more about which political party you belong to than they do about the job you're doing. These people most likely have unlimited funds from the opposing party, and truly do not care about honestly evaluating the job the governor is doing. Go ahead and waste your time...I'm sure you already know this will go nowhere. It will save a lot of time and trouble if the recall petition for the NEXT governor (after Snyder) is smoothed out, approved and legitimized before the next election takes place. Procedural matters should never stand in the way of every elected official's right to be duly, easily and quickly subjected to recall as soon as he or she is elected. It's the only sensible way to deal with officials who are not elected unanimously. It's certainly their fault if they're not! Tue, Apr 10, 2012 : 3:33 p.m.
@veracity, please provide the facts that reduction in unemployment insurance increases the homeless. You provide the ol' same talking points but back it up with no facts. It's getting old. Tue, Apr 10, 2012 : 4:40 a.m.
Paul: Which of Snyder's policies do you like the most: his $1.8 billion tax break for businesses paid for by new taxes on retirees, or his disenfranchisement of city voters, or the reduction of unemployment insurance which increases the homeless and reduces the state's GDP, or the reduction in state funding of schools and cities? Tue, Apr 10, 2012 : 1:28 a.m.
Mon, Apr 9, 2012 : 7:32 p.m. The Progs are livid over the oh so minor haircut they are getting from the Govenor. If it were up to me there would be massive cuts in government spending. Tue, Apr 10, 2012 : 9:38 p.m.
@Sparty, So you do agree that tax cuts for businesses not only bring companies into our state, but also allows existing companies to employ more people. Glad you made that clear! Tue, Apr 10, 2012 : 6:03 p.m.
Nearly, if not all, Film making studios in the state have closed down as a result of Snyder's actions laying off thousands of people already employed. Do you get that maallen? That's the difference between incentives for that business and $1.8 billion dollars given to businesses at the expense of everyone else in Michigan. @sparty, Did I read you right? You are complaining about the film making incentive reductions? In other words, tax breaks for the movie studios. Please tell me how tax breaks for the movie studios (which your post indicates you are for) is any different than tax breaks for small businesses? School vouchers for K through 12, switch public pensions to defined contribution plans, pass right to work law, higher copay for public worker benefits, roll back state staffing levels by 25%. Eliminate the income tax. Privatize the universities. Tue, Apr 10, 2012 : 5:34 a.m. The cuts to k12 education, higher education cuts, cuts to public safety programs, unemployment cuts, catastrophic auto insurance cuts, workers comp cuts, new pension taxes, higher state income taxes for everyone, elimination of public domestic partner benefits, state staffing levels, film making incentive reductions leading to studio closures, etc. etc. aren't enough or you? Mon, Apr 9, 2012 : 7:21 p.m. It is a democracy and the commission has the right to vote either way. I just can't get over the &quot;I want everything for free&quot; crowd, wanting to dismiss one of the first Adults, this office has seen in over 8 years. At least he still lives here (Michigan and not California) and is doing his best to help people that are not willing to do the heavy lifting to help themselves. As a puppet of the labor unions, that by the way have never created a job, you think Virg B would have been better for our state? Tue, Apr 10, 2012 : 1:56 p.m.
Tue, Apr 10, 2012 : 5:27 a.m.
You realize that Snyder lived 2 years in Chicago while working for Coopers &amp; Lybrand and then 6 years in California while with Gateway? I'm not sure what that point of yours was but assume it was a slam against the prior Governor, but she did move to get a job. Are you suggesting that Virg B, as a Mayor of one of the largest cities in the State has never created a job? What jobs plan has the Snyder team passed specifically? Tue, Apr 10, 2012 : 4:35 a.m. Yes. Well, it looks like chain call got all the Republicans in the county to vote favorably for this list of misinformation and myths.